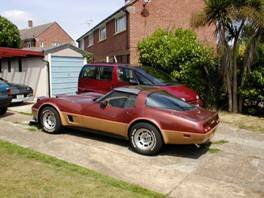 The car in this article is an unusual 1981 Corvette which we saw on Ebay.com, bid for, lost, saw it again, bid again, won and shipped over. Perhaps not the most sensible thing to do but we are thrilled with the result and somewhat surprised that we did it. 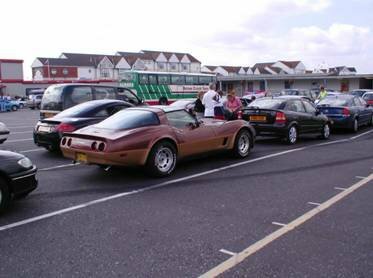 Many years ago my wife, Lesley, decided that we would buy ourselves a C3 Corvette as a retirement present - however as we got a little older we realised we might not be able to get in and out of a Vette if we left it that long! Now what with it being the 50th anniversary year and all that we decided the time had come to add a Corvette to our Camaro and Lumina APV - and we started looking. Many of the cars we saw in the UK were either too expensive, needed lots doing or had been messed with so we started to look further and ended up on Ebay.com with the intention of importing one ourselves if we saw something we liked. 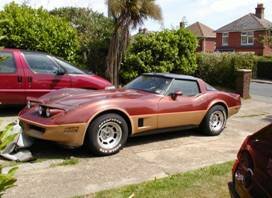 After many visits we saw this Corvette and Lesley decided we should have it as it was the same colours as our first Camaro Z28 but upside down - that's as good a reason as anything! 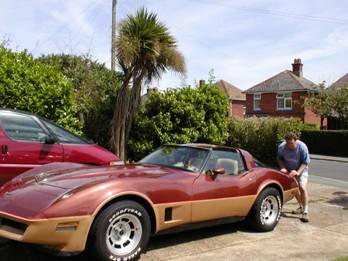 Following many e-mails to the private sellers we bid for the car but sadly lost out to an American bidder at the end. That was that we thought, but no, about 3 weeks later the car was back on, the buyer had not come up with the money, law suit started etc and we had another chance. I contacted the family again and found more out about the car - they had known it from new and had bought it from the original owners (family friends) and had owned it ever since. It had been kept in great shape with only about 2500 miles a year buy they had relocated from the West Coast to Pennsylvania and now needed to sell it as space was at a premium . I had the car checked out and all was OK and we felt we had built up a good relationship with the seller so off we went again. This time at 1am on the 21st May we got the car and the sellers, Jim and Sandy, phoned us to say how happy they were that we had won the car. We did some money type stuff on the 22nd and the car was eventually legally ours on the 30th May. I set out to arrange shipping to Southampton and Jim sent some of the items in the sale of the car, custom cover and loads of new bits and pieces etc, by FedEx as he was worried they would disappear on the sailing from Baltimore. Jim had offered to drive the car himself to Baltimore but it would be a little time before he was free to do it. This was great for us as we were not in a rush to get the car and I would rather have him drive it than arrange for someone else to do the job. On the 13th June he drove the car to the port for me admitting there were tears in the household when 'their baby' left. Shipping was handled by Wainright Bros & Co Ltd of Southampton and they provided an excellent service, clearing customs etc without any problems. They used a company called Seabridge International in the US who Jim spoke very highly of. We followed the voyage of the Tampa closely as it was the sister ship of the Tricolor which lay on its side in the Channel full of 30 millions of Merc's and BMW's! The car landed without incident on 9th July, was cleared and I eventually picked the car up on the 11th to bring it back to the Isle of Wight. Having just sailed from Baltimore the poor thing has to negotiate the Isle of Wight Ferry! What a come down…. Having all the paperwork I decided to take a day off on the Monday 21st July and visit my local DVLA office (Portsmouth) rather than send it all by post. Now we all like to tell horror stories about the DVLA but my story is different. I entered the building and joined the huge queue at 10:07am, I left the office having done everything at 10:21am and went home. At 7:30am on Tuesday 22nd (the following day) the postman delivered an envelope with all the Corvettes stuff back with its new number. That is less than 24 hours. Credit where credit is due that was brilliant - well done DVLA! Number plates were made and she was on the road on Wednesday 23rd July. Our saga was over! We love the car. It is completely standard and has all but one option. I have registered it with the L81 registry in the States and they tell me very few were made in this colour and they only know of one other in Cincinnati. I have done a few things on her mainly for my own peace of mind like changing oils and replacing hoses, but the car is in great shape overall and has not missed a beat in the 1400 miles so far done. Before Jim sent the car he had replaced the exhaust, battery, shocks, disks, pads, tyres and had fitted new suspension bushes and a KN filter element. He even bought locks for the glass t-tops so they would be safe for the journey. The car is great for 22 years. Friends of ours either think we were mad or really brave to buy a car this way but our story shows it can be done and there are some really nice people out there selling some really nice cars. Jim and Sandy e-mailed us to say they are coming over to the UK shortly so we can meet up and see their 'baby' has gone to a good home. Now would we do it again?? Lesley has expressed an interest in 'something big'….